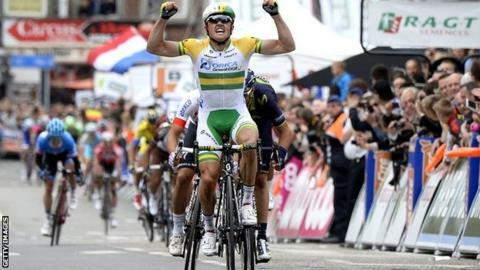 Simon Gerrans became Australia's first Liege-Bastogne-Liege winner with a sprint finish in the Spring Classic. The 33-year-old Orica GreenEdge rider outsprinted Alejandro Valverde and Michal Kwiatkowski to clinch the 100th edition of the one-day race. "It's an incredible victory, a dream come true," said Gerrans, who won the Milan-San Remo one-day race in 2012. Britain's Chris Froome, the Tour de France champion, withdrew through illness ahead of the race. Gerrans' best previous result in the race had been a sixth place in 2009, and he added: "I don't know what I feel right now. "It's a really tough race at the end, so thanks to my team. They got me to the final. I didn't have good legs but I kept going and thanks to the team I could win. 1. Simon Gerrans (Aus/Orica) 6:37:43"
5. Domenico Pozzovivo (Ita/AG2R) +3"
9. Daniel Moreno (Spa/Katusha) +5"
10. Romain Bardet (Fra/AG2R) +6"